End-users today focus more on extending the shelf life of their food and preventing cross contamination. Moreover, more foodservice like restaurants and groceries which needs food storage containers are continuously increasing. These two factors drive the growth prospects for the global food storage containers market. 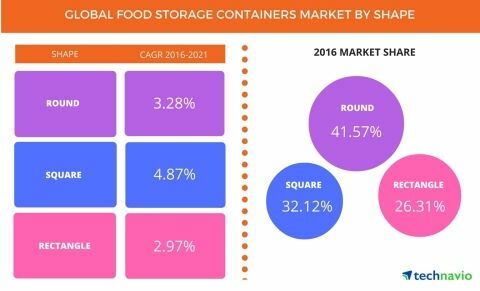 According to the recent survey of the well-known market research company, Technavio, the global food storage containers market will continously grow with a CAGR of nearly 4% and reach USD 2,913.6 million by 2021. During 2016, the Americas has the maximum market share and APAC and EMEA rank after it. The analyst forecast that the Americas will go on dominating the global food storage container market in the coming years. In the survey, we can also find that round food storage containers have a maximum market share than square and rectangular food storage containers. According to the lead analyst from Technavio, Manu Gupta, the round containers are estimated to occupy about 25% less space than square or rectangular containers for food. Even though the competition is intense, the global demand is increasing as well. Easylock is confident with the quality of our products and our goal is to become one of the top food storage container suppliers which is famous for providing Easylock 100% leakproof plastic food containers and heat-resistant microwavable glass food containers. We aims at develop a wide range of food storage containers that are efficient and require very less maintenance.